Halloween always evokes the secretive nature of hidden chambers and trick opening mechanisms that play with one's mind. 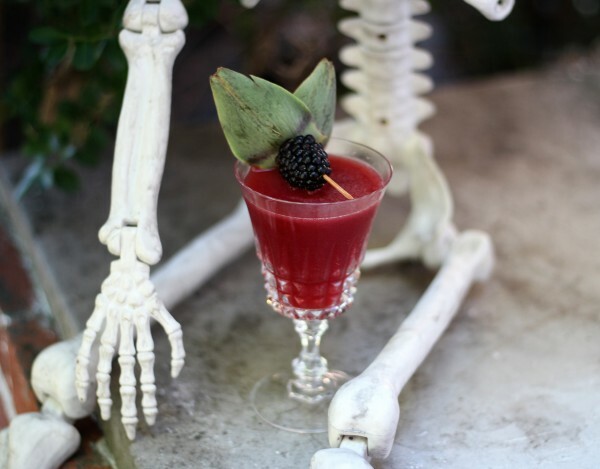 Edgar Allen Poe was a master of the psychological thriller and his poems are perfect for Halloween - and cocktails too, as it turns out. The “Raven” cocktail takes its cues from the famous poem, about a man going slowly crazy with his memory of long lost love, driven mad by the incessant yet mysterious tap tap tapping of the black raven who appears from nowhere. Rum is perfect for a Halloween drink and I've increased the atmospheric melancholy and funk, if you will, by using an agricole rhum, which is made from pure sugarcane rather than molasses. The result is incredibly moody and delicious. Add a special dose of dark rum as well to really set the tone – Poe is rather dark, after all. Finally there's a little amaro, that bitter Italian herbal potion, to capture the bittersweet depths of despair evoked in the poem … swirl it all together with pomegranate to get that rich deep blood red color along with an underrated but perfectly fall festive flavor. These are the perfect treat for an evening full of tricks - cheers!